The TNW Review: blekko - Is this finally a Google killer? The TNW Review: blekko – Is this finally a Google killer? blekko, a new search engine first profiled on TNW in late July, founded in 2007, and funded in part by two ex-Googlers, is now in open beta according to an announcement made via Tweet. When blekko was first demoed, those behind the search engine made it clear that it was not out to kill Google. Rather blekko claims to be concerned with allowing users to execute searches that you “can’t do anywhere else,” by focusing on ‘slashtags’ that allow users to search from a particular perspective. The ‘web search bill of rights’ targets some of the issues Google and other search engine users have with search in general, most notably items 3-6, 9 and 10. Privacy is a major concern TNW has addressed previously, Google’s search algorithm has long remained super secret even while refining it, and despite the claims of Bing, Yahoo, and Google, search results on all three are nearly identical, an item profiled here. 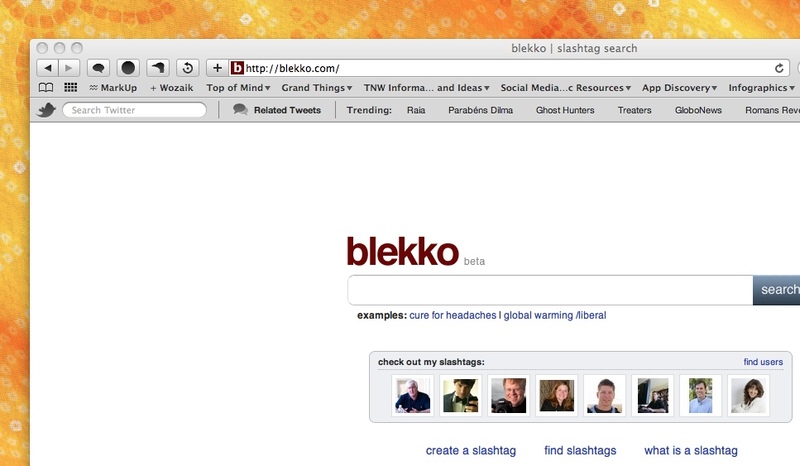 That said, where does blekko fit into the search game? Is it a Google, Bing, and/or Yahoo killer, or is it a site that will compliment your search engine of choice? What follows is a brief video introduction to blekko, a comparison of popular search terms when entered into the aforementioned search engines, including blekko, culminating with our thoughts on blekko’s future. The first item to note is that for Google, Yahoo and Bing, all present “sponsored” links and spammy options under the search bar. Alternatively, blekko begins its search with suggested slashtags, and per its ‘web search bill of rights,’ allows users to add a slashtag, view seo, ip, cache, and chatter information, in addition to allowing one to mark an item as ‘spam’ after entering a search query. 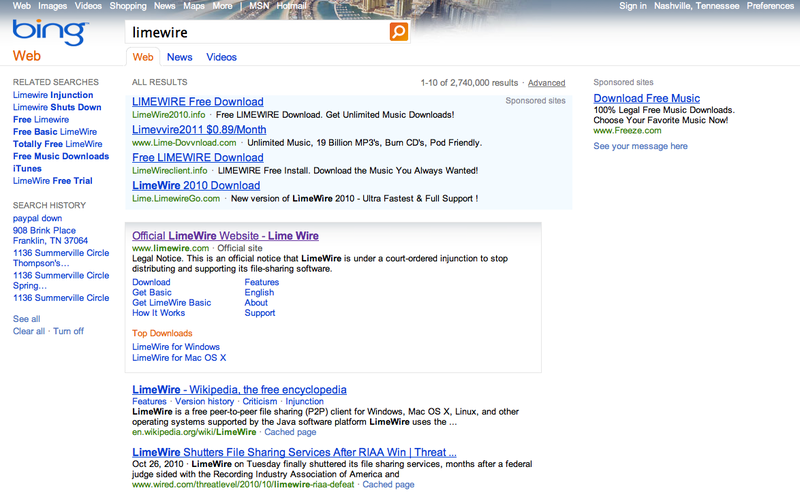 After sponsored information, Google’s first three entries related to limewire are: news, the official site, and Wikipedia. Bing’s are: the official site, Wikipedia, and an NPR link. 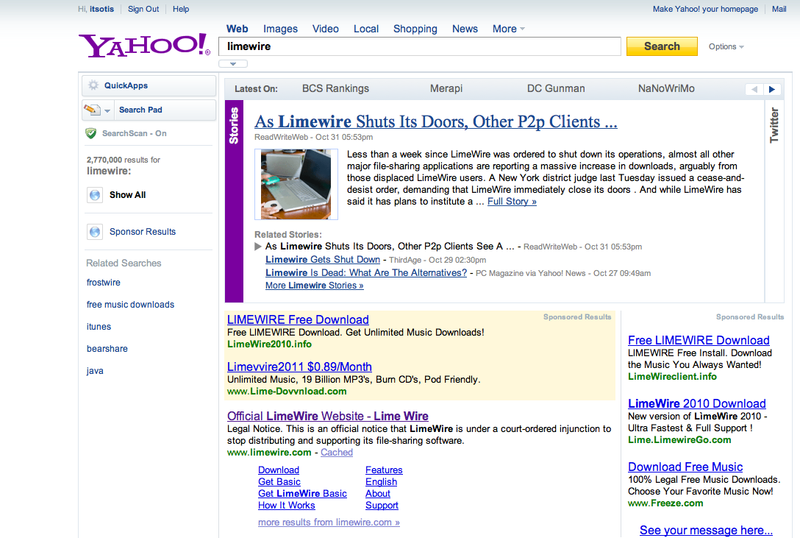 Yahoo’s are all news stories, and blekko, which doesn’t included sponsored links at the top, are: the official site, information about limewire, and the Wikipedia entry. Why the top returned result would not be the official site on all the search engines used for our research is confounding. The main focus of Yahoo, Bing and Google all appear to be on providing some form of news in the top three returned results, with Yahoo’s results consisting of nothing but news. 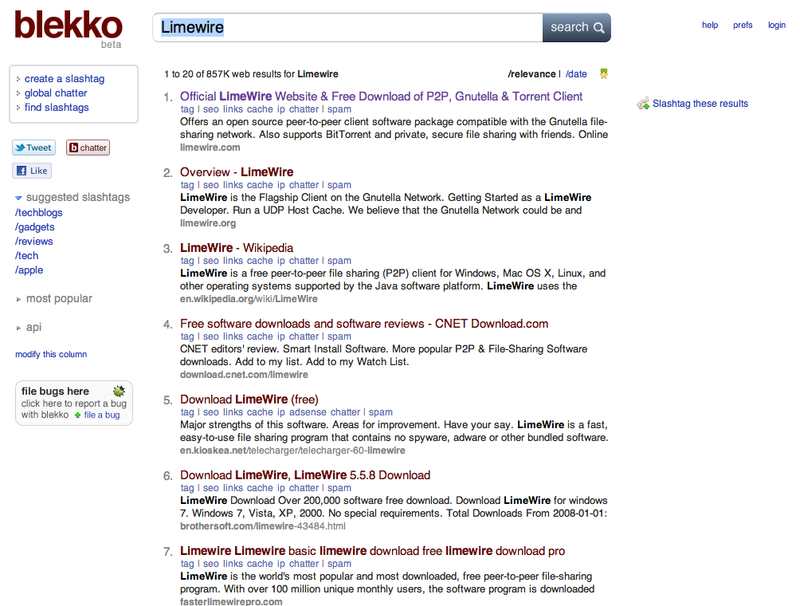 blekko focused only on the term “limewire.” If one were to want news, one could enter a search query for “limewire /news” and news results would be returned. The most interesting finding is that Bing and Yahoo’s results differ even though Yahoo’s search back-end is conducted using Microsoft technology. The limewire comparison is the only search query which yielded such results. 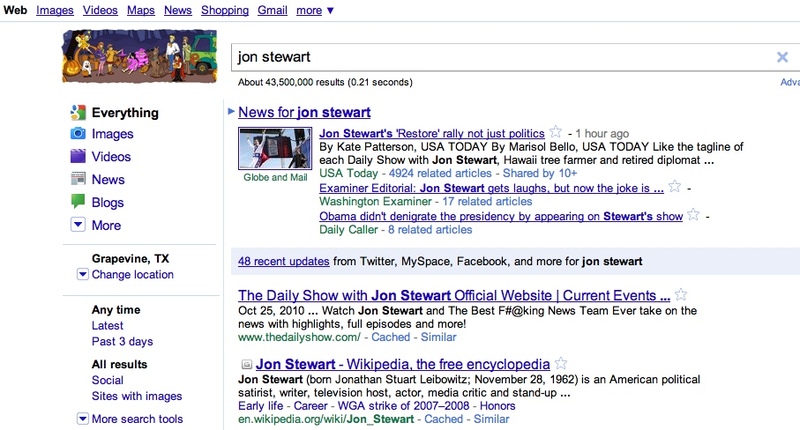 A search of Jon Stewart on Google yields: related news, the official site of The Daily Show, and Jon Stewart’s Wikipedia entry. 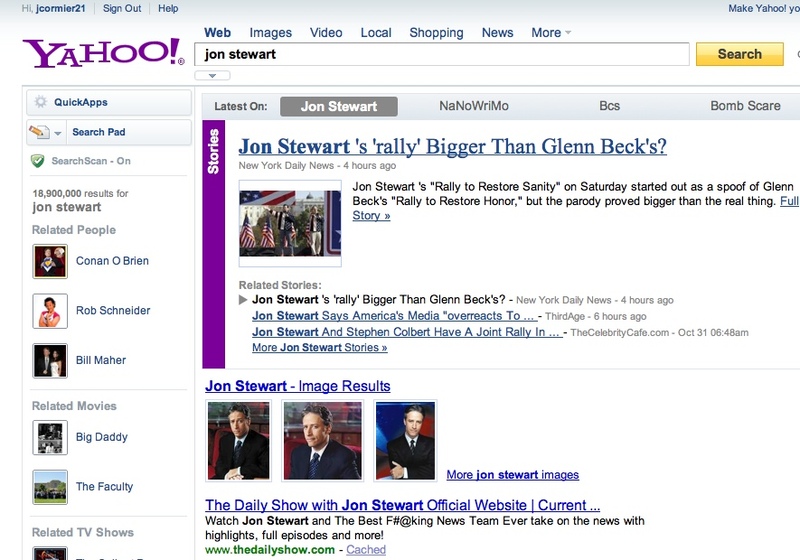 A search on both Bing and Yahoo yield, in the same order, the official site of The Daily Show, image results and related news. A search on blekko yields: the official site of The Daily Show, Jon Stewart’s Wikipedia entry, Jon Stewart’s IMDB entry. As with the limewire comparison, blekko is the only search engine that did not include news in the top three returned results. 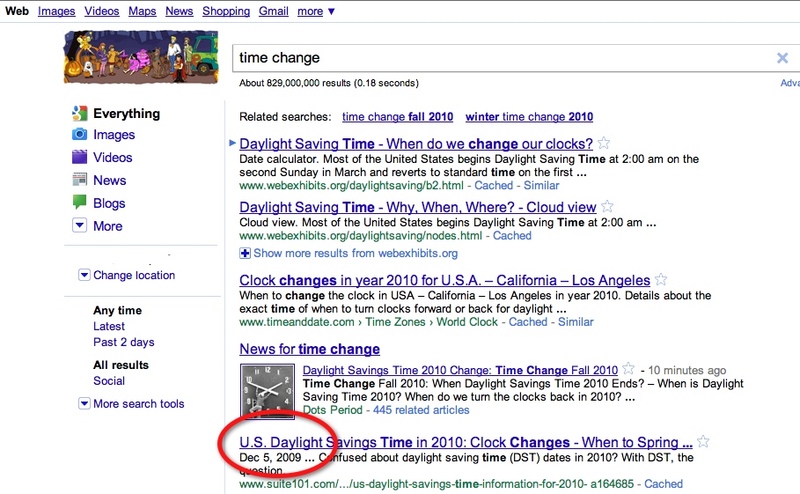 A search of time change on Google yields: a question answered by webexhibits, information for Los Angeles, CA, News, and a story from 2009. 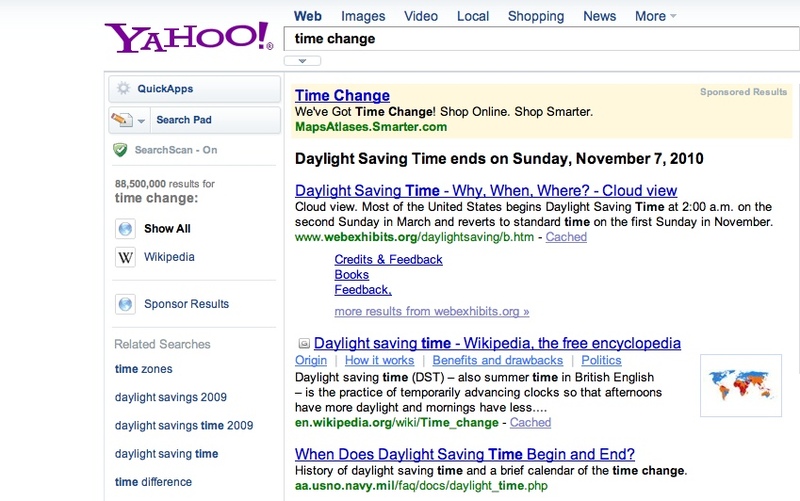 A search on both Bing and Yahoo yield, in the same order, a question answered by webexhibits, a Wikipedia entry, and Military F.A.Q.s. A search on blekko yields: information on energy conservation in California, a science and health website, and a Wikipedia entry. What a blekko search query presupposes is that one does not want news, sponsored links or other items returned in a basic search. There’s no sifting through at least half of a page other information to get to specific result. Even absent slashtags I found blekko’s returned search results were more clean, less apt to overwhelm, and returned results as fast and as relevant, overall, than those provided by Google, Yahoo and Bing. 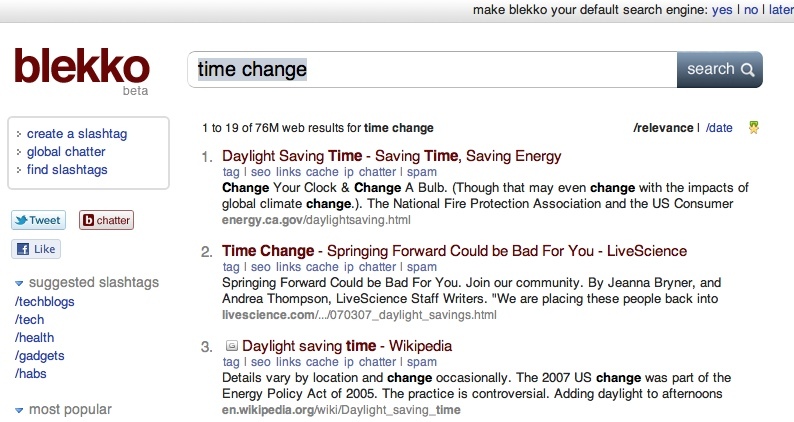 Echoing a point made by our Alex, blekko’s largest shortcoming at this point is their basic search results are not completely refined, as shown by the time change comparison results above and their diversity. This is to be expected and should get better as the service evolves. blekko is not a Google, Yahoo or Bing killer. Might blekko one day become the dominant default search option? Certainly. That said, Google, Yahoo and Bing all offer other features that blekko does not, email services being the most notable. As it now stands, blekko is a good, and getting better, search option, and something that will compliment, and not kill Google, Yahoo and/or Bing. Want more insight? Robert Scoble has just posted his video from his Building 43 project featuring an interview with the brains behind blekko.